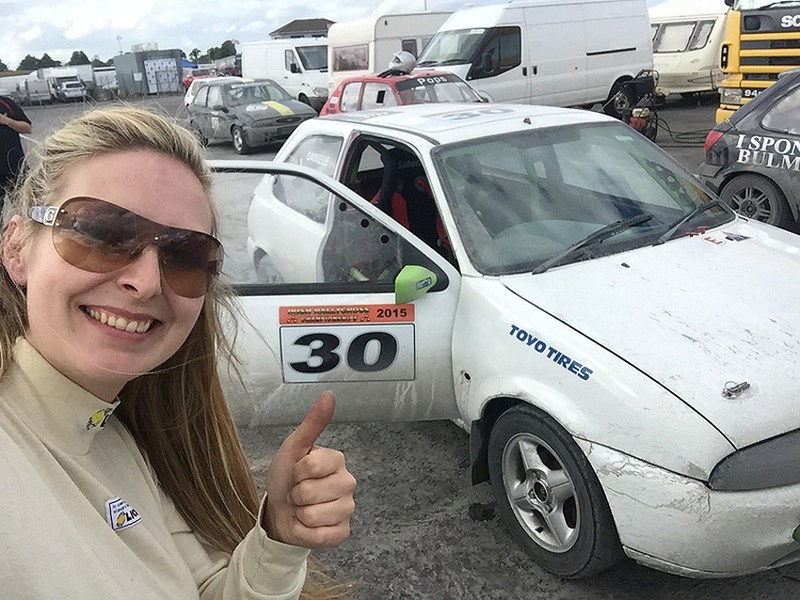 Having had no previous training or experience properly on track, I was actually very excited about trying my hand at Rallycross for the first time. I was surprised as most of the seasoned veterans around me in the paddock had commented about their nerves, was I weird for really looking forward to beating a Ford Fiesta 1.2 16V around Mondello? My practise went well as I got to grips with the dry to loose ground and vice versa. Only one practise session before the heats started. As I was new with no experience I was in the B heats, throughout the heats, my times were improving dramatically to the heats before, especially on my joker laps I seemed to be within the top 3 fastest laps, including those in the A heats. My consistent improvement secured me a 5th place grid position in the A Finals! As I pushed the little Fiesta I was thoroughly in race mode and no-one was getting past me! I held my position and finished a very respectable 5th, beating a lot of experienced guys, I left an impressive trail on my first time out. A big thank you to Keith & Broderick Kerrhawe for offering and preparing their Fiesta for this experience. Mondello seems to be coming my second home these past couple of weeks! 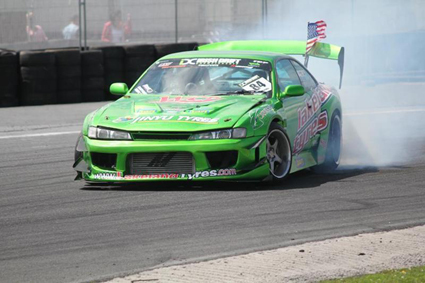 This time I’m back with The Green Monster for the biggest event of the Irish Drift calender, “Global Warfare”. With over 145 drivers in total and over 15,000 spectators, the event was huge. Saturday we began practice, something was just not right. Having built The green Monster from the ground up, we have grown together over our 5 year partnership. After a couple of laps I felt like I was imagining a small slip of the clutch, On another lap I tried to determine the problem, the clutch wasn’t slipping but something was definitely wrong. I looked at my watch and it was a little over 1 hour until qualifying started. I had a split decision to make. I radio’d to my mam whilst I was still on track, to gather as many guys as she could to help me remove the gearbox and see what the problem was. Whatever about missing qualifying due to mechanical issues, I knew I had time to at least try resolve the problem. We got the gearbox out and found the problem, well 2… Luckily I had one spare clutch disc which had become damaged after a part on the standard clutch fork and bearing carrier had split, it was an absolute mission to run around the pits to try and find one bolt to place under the clutch fork! Needless to say, with literally 4 cars in front of me to my qualifying place, I made it back on track. After my 2 qualifying runs, I missed qualifying by a measly .4 of a point! It’s the first time in 4 years I failed to qualify for an event, it definitely hampered my thoughts and feelings, but we all have a bad day I suppose. 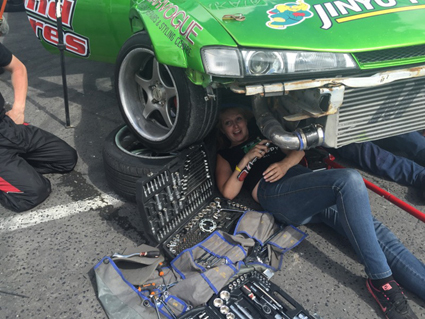 The Irish drivers are renowned across the World for their aggressive and brave style of driving across all spheres of Motorsport, the Polish drivers are pretty level on the amount of crazy within the Drifting world! With mega powered cars, some reaching 1200bhp, my car is currently 465bhp, so that is basically almost like 9 Nissan Micras (exaggeration!) under one bonnet, it is absolutely INSANE power for a car! My biggest rival for the Queen of Europe Championship this season is Karolina Pilarczyk from Poland. Her car is currently producing over 700bhp and I was coming to battle on her home ground. For me to beat Karolina on her home soil was going to be the toughest challenge of the season. The track was on a mountain road with absolutely breathtaking views, it is the most extreme challenge on track I have ever faced, there was literally not 1mm space for any error, this track was to test everything, car, driver, power and all rolled into one then again just to get to the top if the hill without hitting pretty high kerbs of the footpath, never mind being surrounded by public and trees. 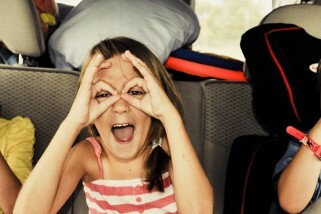 There was a lot to think about! After 2 sighting laps, my 3rd lap I was pretty comfortable at the points on track and what I had to do, at the fastest point of the track I initiated up the hill, and immediately I knew I had a problem, my clutch pedal had stuck to the floor, my engine had died, I pulled the handbrake and pushed the brakes, BANG, I had hit the kerb and gone down over a bank, narrowly missing 2 trees. My initial reaction was to check the front of the car, going on experience in general if the intercooler and radiator at the front of the car are still intact, the damage should be ok (within reason!) The recovery truck came and took The Green Monster back to my pit area so we could assess the damage further. Back in the pit area there was no time to waste, the car was back up on its side true Irish Shanahan style and I was straight into work to see what was causing this issue. So somehow after finding 1 guy within the event as a spectator, who had no phone on him, we managed to get the broken piece to the guy to put a solid weld to prevent any more breakages. Literally within the 10 minutes to my qualifying time, The Green Monster was back on all 4 wheels and we were almost ready to go for qualifying! Then as if my prayers were answered, an emergency drivers briefing was called, the remaining qualifying would be put forward to the next morning due to road closure restricting – Were my prayers answered? Sunday arrived and I was so much more happy and comfortable in myself, the car was sorted, I wasn’t rushed out to qualify, I was relaxed and didn’t feel so ill like the morning before. With no practice laps, I took my qualifying laps in the PRO series to give myself some test laps before the important qualifying, the Queen of Europe and Street Legal class. I got 2 secure and comfortable qualifying laps, considering no practice after my crash the day previous. Somehow, the results were amazing with a turn of events, I had topped the top qualifying pot in QOE and 7th place in the King of Europe, men’s league. as the day went on, I went though the battles and started to feel something start to play about again with the pedal. I lost my first battle in the men’s series by one point, on driving into the pit area, I realised that things were for the best because I wasn’t confident I would get the car on another lap. All was not lost though because aside from absolutely all the obstacles, I managed to do what I had set out to do in Poland, beat Karolina, qualify first and win the event! I am now currently leading the Queen of Europe Championship and second in the King of Europe (mens) Championships respectfully. Next weekend August 22/23rd sees me back in Hungary to compete at round 3 of the Championships. I have made a lot of alterations and improvements to save these demons from the past two events popping up, so without the worry I can drive 110% and hold my positions in both Championships as we hit the semi final event, the final being in Slovakia at the end of October. Stay tuned to my Facebook page for the most regular updates, especially video footage of my journey to and from the event, alongside the all important track side updates.